The order Primates in the strict sense—Euprimates or primates of modern aspect—is defined by a familiar suite of synapomorphies. Some of these may represent adaptively neutral contingencies (for example, the formation of the auditory bulla by an outgrowth from the petrosal, rather than by a separate entotympanic bone). However, others appear to be telling us things about the basal adaptations of the order. Compared to primitive placental mammals, primates have a reduced sense of smell and an enhanced sense of vision. primate eyes point forward and are encircled by a ring of bone. The first toes of primates are stout, divergent grasping organs. All primates have reduced, flattened claws on the first toe, and most of them have them on the other digits as well. The adaptive meaning and origins of some of these morphological synapomorphies of the primate order are discussed in other chapters of this book. quadrupedal primates walk, most of them tend to swing their diagonally opposite legs back and forth more or less together, so that when (say) the left front foot is off the ground and swinging forward, so is the right hindfoot, and so on. This so-called diagonal-couplets pattern is equally evident in horses and many other terrestrial mammals (Figure 1). But when horses swing a diagonal pair of limbs forward, the front foot in the pair strikes down first. In a monkey or a lemur, the hind foot in the diagonal pair strikes down before the forefoot. The horse pattern, in which each hind footfall is followed by the fall of the forefoot on the same side, is called a lateral-sequence (LS) walk. Most mammals employ LS gaits in walking. The primate pattern, in which each hind footfall is followed by the fall of the opposite forefoot, is called a diagonal-sequence (DS) walk (Hildebrand, 1965, 1966, 1985). DS walks are seldom seen in nonprimates. 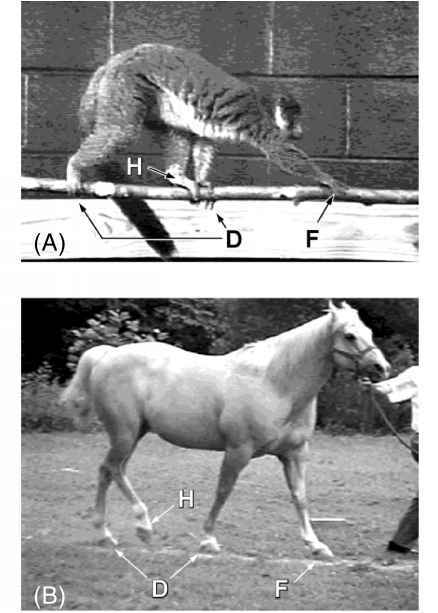 The peculiarities of primate gaits were discovered in 1887 by Eadweard Muybridge, but they were not analyzed quantitatively until the 1960s, when Milton Hildebrand devised a way of quantifying the differences between various symmetrical gaits. These are defined as gaits in which the first half of each cycle is the same as the second half, but with the movements of the left and right limbs switched. Symmetrical gaits include the walk, trot, and pace. 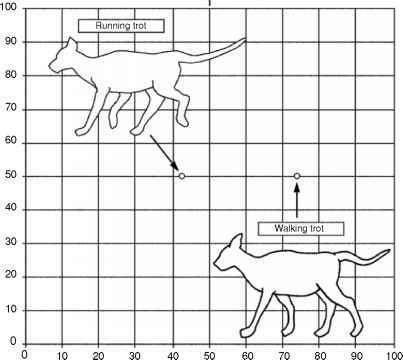 Hildebrand pointed out that most of the differences among such gaits could be represented by just two numbers, and so any such gait could be specified by a single point on a bivariate plot, the Hildebrand diagram (Figure 2; Hildebrand, 1965, 1966, 1985). The horizontal or x-axis on the Hildebrand diagram, which we will refer to as duty factor, represents the percentage of time a foot stays on the ground during one complete gait cycle, from one touchdown of that foot to the next. 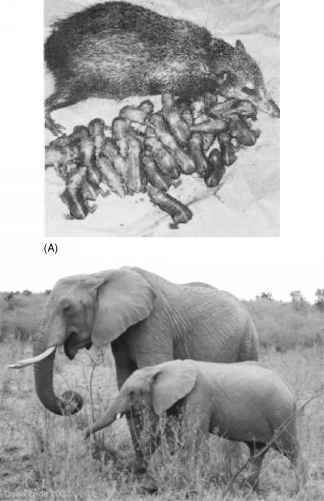 In general, the higher an animal's speed, the lower the duty factor for each foot (Figure 2A; Demes et al., 1990, 1994; Gatesy and Biewener, 1991; Grillner, 1975; Prost, 1965, 1969, 1970; Vilensky et al., 1988). Hildebrand's y-axis variable, or diagonality, is the one that distinguishes primates from most other mammals. This variable expresses the phase difference between the front and the hind end as a percentage of cycle duration (Figure 2B). If the hindfeet are exactly in phase with the forefeet, so that the right fore (RF) and right hind (RH) feet touch down together, followed by the simultaneous touchdown of the left fore (LF) and left hind (LH) feet, diagonality is zero (or 100). Such a gait is called a pace. If diagonally opposite feet touch down together (RF + LH, LF + RH), diagonality is 50 and the gait is a trot. In a lateral-sequence walk (RF touchdown, then LH, LF, RH), diagonality assumes a value between zero and 50; in a DS walk (RF, RH, LF, LH), it lies between 50 and 100. Figure 2. The two axes of the Hildebrand diagram. (A) variation in the x-axis only (trotting gaits, diagonality = 50). The X variable, here called duty factor, represents the time that a foot remains on the support as a percentage of one complete gait cycle (i.e., from one touchdown of that foot to the next). In the symmetrical gaits of most mammals, duty factor is approximately the same for all four feet and has a close inverse correlation with speed. When duty factor is less than 50, all four feet are usually off the ground at some point in the cycle (aerial phase), and the gait is a run; when it is more than 50, there is no aerial phase, and the gait is a walk.